Since a long time I wanted to make a comparison between an Iray and a Bryce render. Maybe this is a little daring, since Bryce's render engine is no longer the most advanced of its kind. But have a look by yourself. In Daz3D all materials are optimized for Iray and not for Bryce, it means I had to adopt and tweak them for Bryce quite a lot. For the skin I used the original diffuse, specular and the SSS maps. The character is Genesis G8 Kallisto. The color of her top is different because the color information cannot be transferred to Bryce and I had to guess, which I did not that exact obviously. In regard to the lighting I tried to get close to Daz3D original lighting. But as you can see, there are noticable differences. Anyway it is interesting, how different both application are. In Daz3D I used a point light with a soft shadow and a temperature of 4500 Kelvin. In Bryce I used a orange tinted sphere light with a squared falloff. I both scenes I used the same HDR background and IBL to brighten up the shadow areas. Both pictures are slightly postworked in Photoshop. I used adjust levels. The Iray render ran around 10 minutes, the Bryce with Premium Effects TA and 144 rpp around 4 hours. Electro-elvis: interesting comparison. I assume the first one is DAZ - Iray and the second is Bryce? The texture of the dress is different, more leathery in the first one. The lady is more pale in the second one. Strange how in the first one, more light is on the background and her skin is relatively dark compared to the background, while in the second one the skin is the brightest element and the wall is slightly darker. On the other hand, the dress catches more light in the first one, probably because of the colour/texture chosen? If you can put render time to one side - which I know for some is a great deal to ask, but for the sake of argument let us say that you can. The weakness of Bryce is the lack of SSS and normal mapping. The weakness of Iray - which is in essence budget Octane - is the high level of automation inherent in physically based rendering (PBR). As someone who aspires to photorealism, I was at first totally enamoured of PBR rendering. Having played with it for a few years now, I've changed my views somewhat. It is not that I think there is anything wrong with PBR, it is fit for purpose, if your purpose is photorealism, but otherwise it is something of an artistic style funnel. It automates so much of the rendering process that it creates its own style, damping your own input and imposing its own, a style that if you have seen enough renders, is as universal as any novices first Bryce render of a silver ball over an infinite plane. In the end, I believe, the skill of the artist will eventually become apparent no matter the tool employed. These experiments are brilliant, at a glance they tell us so much, but having performed so many myself, eyeballing them is not the same as doing them. I imagined that just using DS would eventually lead me to an "accommodation" with the software, but instead what I learned was, that no matter how competent the render engine was, DS and I were never going to be friends. If I render something it is in Bryce or standalone Octane. Most of my time is spent in Modo, UVlayout and Substance Designer - from which I obtain no finished output - nevertheless, I find myself happily immersed in these abstract worlds solving their equally abstract problems. In the background a 5 hour plus Bryce render plods on. Thanks to having a multi-core processor, I can forget about this process and get on with other things. Technology levels the playing field between old software and new. Give Bryce SSS and normal mapping and the finished result would be difficult to distinguish from any modern render engine - the render time being invisible to the casual observer. Electro-Elvis - great comparison. I find the skin on the second example better, the specular plays very well here while on the first example the skin looks a bit like it has some powder applied. Both renders imply that there is a huge light source. The lady is not far from the wall considering her size and the size of the shadow cast on the wall by her. The shadows are too blurred in my opinion (standing myself at about the same distance from a wall, with one lamp shining at me, the shadow edges are by far not so blurred). The second example is even more extreme. Comparing render times is a bit difficult. I'm not very familiar with Iray but more with Bryce. There are many strategies to increase speed. We often have options engaged that make the render longer but do not contribute to the quality of the result. DAZ Studio + Iray is a very frustrating piece of software for me. The output can be absolutely brilliant, but the process is an utter ball-ache. I was just messing with the new International Space Station model by Mely3D in Studio, and I so desperately wanted to bring it into Bryce just so I could give it an appropriate background. I've no idea how to remove the ground plane in Studio, or change the background colour, or stop whatever automatic light it is that shines on everything. But in Bryce the materials (shaders?) won't work properly so it looks poor even though I can set a scene up in minutes. People often complain that Bryce has hidden controls via an inconsistent interface, but it's junior school in that regard compared to Studio. Even the figure posing is clunky, and that's supposed to be its main purpose. Ah, but the GPU render speeds are truly amazing. OK, so I never, really never, tried a render in DAZ with Iray before. So, it must be clear, that I have no clue, what I am doing. However, I did make a render in DAZ (the square on) and one in Bryce from the same scene. Sorry, did not exactly get the location of the camera right (did not really try too hard). The DAZ render, with Iray, was not finished after quite some time. And, I could not find any indication what time it would take. That must be the cause of the grainy render; I stopped it before it was ready. What I like in the DAZ render, is the colour of the background. But the doors in the back are not OK. I have to say, that the textures/materials used are in no way Iray optimised. I also feel, that there is too much light on the figures in the foreground in the DAZ/Iray render. Part of that is probably due to a lack of understanding of the lighting in DAZ. The second render is in Bryce (regular anti-aliasing). Since I have more experience in Bryce, I was able to make it interesting to my eyes. The door in the back looks better than in DAZ/Iray. And, I was able to add some haze/fog in Bryce, which helps the atmosphere. I also tried a render in 3Delight (or whatever it is called), but than the figures got really light, if I wanted to have some light in the background. And the floor got fully black. Again: lack of DAZ-capabilities on my account and not proof of lack of capabilities of DAZ. So, although there is much to be said on my errors in DAZ, etc. I did want to show these two anyway. It supports what others have said: it is as much about your knowledge and experience in the tools, than about the tools themselves! 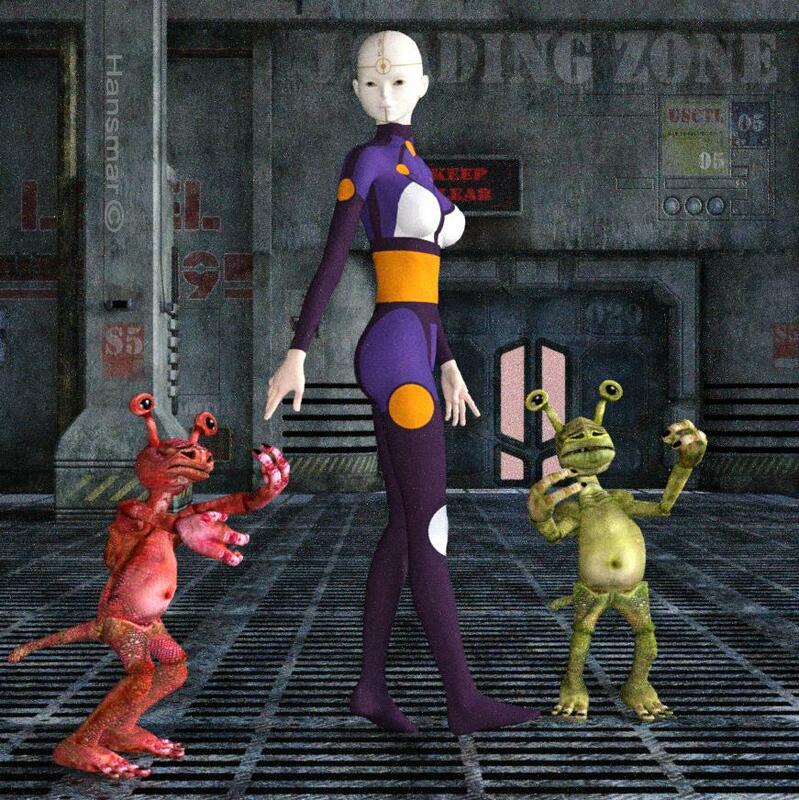 The girl is Aiko from DAZ with a cyborg texture and the other two are RDNA sluggians. The environment is Level 19. First Thanks a lot for all your comments. Very appreciated. While it is already late I try to comment them tomorrow. I added a second Bryce render. Compared to the first Bryce render there are two major changes here. First I added a bump map to the clothes. The problem is here the original model has no bump map anymore, but a normal map and Bryce as far as I know is not able to calculate normal maps accurately. You can use them (or at least I used it that way) in the bump channel and then they have a certain effect. Though it is not very pronounced in comparison to the Iray render. To boost the effect it might be necessary to transform a normal map into a black and white picture. I am not quite sure, if that would be a kind of workaround to handle a normal map in Bryce. Maybe someone has more experiences with that. Furthermore I added the original transparency map as well. Second I changed the original SSS map of the skin. The original map has a coloured scale from pink to light grey and rather pale colours. I changed it to a palette with strong orange and brown colours and added it to the Ambient channel. Actually I have no idea how the original map in Iray works and it was rather a trial and error process which ends with orange and brown. I think the result come closer to the colors of the Iray render. Rendertime here hardly bearable 25 hours or more. Electro-elvis: I notice there is now also some transparency in the dress. Did not notice that before. Maybe contributed to the long render time. Of the three, I like the skin best in this one. Yes, the dreaded headlamp feature in DS designed to prevent newbies from rendering completely black frames the first time they press the render button. It has to be disabled in the lighting pane. Elvis- You are brave! Nice job so far. I find myself admittedly far more interested in the Bryce versions than the Iray version due to my familiarity with Bryce. I feel we are due for a round of intesnified study into human skin. But admittedly I have no time to do so. SSS maps are interesting. In Bryce we are forced to employ the ambient channel if we want to lighten pixels in a certain way. I have been planning to bake out SSS maps from Octane to apply in Bryce for some time now but alas it hasnt gotten done. One of the things I feel certain about at this time is that a proper SSS map will have to take absorption into account to some degree if its going to get us closer to the look of true SSS in Bryce. It cannot simply be a reddish glow in protruding areas such as at the nostils and ears and fingertips, it also has to provide greenish-bluish hues in the areas that are concave such as the inner eye socket. Skin tends to be thinner in areas where bending is minimal or where bones are immedaitely present which is why I find that the greenish and blue just as important as the pinkish-redness. At this time what would be helpful is an image to upload to demonstrate my findings, but alas that will take a little time. Anyhow, great kick off for the thread and I look forward to seeing where you will take it from here! Hansmar - nice scenes. Difficult to compare Iray with Bryce Regular, too different. I'm not sure the headlamp is off in the Studio render. The right hand of the lady is cut-off. The Bryce render has direct light and a lot of blue haze. Electro-Elvis - I like this example best, the slightly transparent dress looks very realistic. The skin looks very good to me. Have you tried to render without TA, just Premiun with soft shadows? I was just messing with the new International Space Station model by Mely3D in Studio,... [snip]. But in Bryce the materials (shaders?) won't work properly so it looks poor even though I can set a scene up in minutes. @Peter Fulford: I had a quick look at the model in the Daz3D shop. It looks really nice and very well modelled, but it comes with normal maps, roughness maps (never heard) and other maps, which Bryce - as you mentioned - cannot handle properly. If even you cannot find a workaround for Bryce, then I think, it is simply not possible. And I fully agree, with your assessment, in regard to the menu system Bryce is kindergarten compared with Daz3D. At least Bryce has no hidden menus, which Daz3D has plenty of or another "nice" thing is, when the vendor of a product switchs some functionalities off, which you have to switch on first, in case your are able to find the appropiate menu item. @David Brinnen: I have recognized pretty much myself in your sentence "I find myself happily immersed in these abstract worlds solving their equally abstract problems." I read it to my wife and she just nodded vigorously. :-) The other thing you mentioned is the "artistic style funnel". I think, I do understand, what you mean. I used to draw before I dived in the world of 3D. And sometimes I miss this direct approach, where everything comes from you (which also can be quite frustrating) and is not pre-chewed. But because I have to souls in my chest a rather let's say artistic one and a more technical one I think I am so addicted to 3D software. I find the materials in the background of your scene look more realistic in the Iray render (except the door), though they are not bad in Bryce render. Beside the door there are several blue lines which Bryce seems not able to render properly. However I like your Bryce render better, the lighting is more interesting. Sorry it has already been getting late again... hopefully a few more replies in a few days. Have any of you made Carrara and Bryce comparisons with human models and the SS, oops, I mean the SSS features. I have been jumping the Bryce shipwreck, now and then, and swimming like a water rat to other shipwrecks in the CG digital ocean such as Carrara,and Daz when the time demon permits. I find Carrara way better than Daz in most instances, but it's terrain and sky modeling are inferior to Bryce. You can do decent SSS renders in Carrara but as we know to do that in Bryce you would have to contact Leonardo da Vinci by seance. Daz for me has always been a pain in the ___. I got so deperate trying to learn the $%$ing thing, that I even watched that guys teaching videos... oh what's his name ... Vladimir or something like that. They helped, but in 24 hours I had forgotten the confusing steps already. As for trying Iray, the Gulag is preferable. To be honest, I find both Carrara and Daz creepy in their own way.. kind of like macabre Twilight Zone software. I can just see Telly Savalas hunched over his desktop computer trying to figure them out before he goes bonkers. Why is this window double or triple spacing my sentences? Too many digital demons in this murky digital ocean. Electro-elvis: don't feel guilty! It is good for me, to step out of my comfort-zone and try something new. But I don't understand anything of this Iray-rendering yet. And, honestly, I don't think I will really try to get it. And good of you and Horo to tell me about te dreadful headlamp. That indeed gives the problems I had, it seems. I agree, that the background looks better in DAZ-Iray (texture-wise). Indeed, those strange blue bands (that should have been black, according to Iray) worried me too. Horo: you are correct about the direct light and blue haze in the Bryce render. But there is also a fill light and another (soft) direct light to light the shadow parts. Maybe I will play more with the lights, haze and such to get lighting more close to that on the background in the DAZ-Iray render. Flash- Personally I kind of hate Iray. Being an Octane user, so many things about Iray seem needlessly complicated. Carrara is actually quite powerful. Remember that Bryce was designed more for ease of use than power. Carrara actually has some degree of power. While there are things Bryce can do that Carrara cannot, in most cases Carrara holds its own against Bryce quite nicely. Instancing is VERY mature in Carrara, which is a must for realistic landscapes. I agree that Carrara is a fine program, and I bought the pro version for about 99 dollars years ago during a sale. In the late 1990s I owned a copy of Ray Dream Studio parts of which became incorporated into Carrara. Maybe it is the seemingly non-interest of the Daz company in updating, fixing bugs, and modifying Carrara that, to me, gives it a kind of macabre tone. I gave Daz Studio another serious try-out in 2016, watched as many teaching/instruction videos as I could find, attempted this and that and finally had to give up on choosing it as my main "scene construction" CG software. This year I am going to contnue giving Carrara by best efforts so that it will hopefully become my main "scene" construction and render software. The "lighting" options in Carrara are great. Sadly, Bryce has become for me like a an old favorite car that you take a drive in once and a while, but would never drive across country. It does great things, but on too small a scale and rendering time is a nuisance. That's the Daz company's fault and not the fault of Bryce. My future renders in Bryce will all be small scale stuff, like brief poems, or songs, but no major orechestra stuff. Flash- I find it useful to at first begin using Carrara as a content creator for Bryce. For example, Carrara has a fantastic tree generator, an area where Bryce seriously lacks in comparison. It's also a good place to create simple props for your Bryce renders if you are into the vertex modeling. Indeed, it takes time to get Bryce to perform a William Tell Overture. While not derailing the thread any further I'll just mention that for me in Carrara there are three concepts that I find alien when compared to Bryce. Production Frame/ Carrara's version of Instances/ The various rooms. Otherwise I usually understand what's going on. I made a second comparison between Iray and Bryce without a HDRI this time. Three spehre lights (Bryce) or LinearPointLights (Daz3D) provide the lighting. In Daz3D the option "Draw Dome" is swiched off. The character here is Pepper for Genesis 3. To be honest I am a bit surprised and slightly disappointed with the skin in the Iray render here. Though all materials are Iray materials, the skin looks too tanned (Pepper has rather pale skin). And I think the scene is lit up enough over all, for the wall and the clothes look fine to me. The skin color in the Bryce render corresponds much more to the original material. But It is also a bit reassuring for me at least, that Iray cannot provide outstanding results just like that. The old principle applies furthermore. Know your tools. Therefore I still have quite something to learn or simply stay with Bryce. Thanks for watching. The render time for Iray was around 40 minutes for Bryce around 1 hour (TA 64 rpp). Nice comparison again. More interesting light and shadows in Bryce. But her eyes are very different. I often have eyes of people almost disappearing in Bryce, because (I recently noted) a transparent wet film layer does not have 'blend transparency' turned on when transported to Bryce. Maybe this is an issue here, or it is just the effect of light and shadows? Thanks Hansmar. No, the not turned on blend transparancy is not the issue here. Rather shadows and perhaps a too less bright eye reflection (see attached excerpt, which is only rendered with 16 rrp and therefore a bit grainy). I know the "eye" problem. Normally the materials for "eye moisture" and for the "cornea" are not transformed correctly from Daz3D to Bryce. Here I have used an eye reflection of another character, whose eye reflection I have copied from his original material in my texture library long time ago. That might be the reason, why they look different. Beside the two eye materials the transparancy of the hair and the eye lashes normally get lost, too. Actually it is not that difficult to correct it. Maybe you know already how, but if not I am happy to tell you how to do it. Again an interesting test. The second is definitely better, the shadows more natural. Interestingly, the skin is brighter and the trousers darker with the wall at the same brightness. As you say, knowing the tool is key here. Elvis, good to hear that you already knew the pitfalls. So, indeed, it must be shadows. Electro- In my view characters are an entirely different study from other types of surfaces. When comparing Bryce to a pbr render it will be the surfaces with SSS that differ the most. Converging simple surfaces like gold between the two engines will be easy. As I stated before, but still havent had time to produce it; SSS isnt jkust about scattering, it also involves absorption. I assume that part of the reason the characer looks darker in iray is because some of the light is being lost due to absorption beneath the skin leaving less light to reflect back toward the camera. The brucer version doesnt suffer any loss of illumination because the surface is fully opaque so all the light bounces back to the camera. At some point soon I will explain this scatterng vs absorption paradigm and propose a manner of faking to some degree these precious effects we don't have natively at this time. What I would do if I were you is to re-render the Iray example but crank up the lights as needed until the skin looks as expected. Lower the diffuse of the other surfaces like clothing and walls and floors to avoid overexposure which will almost certainly occur once youve gotten the skin to look right. This also goes to the point of why I keep suggesting more powerful lights and less diffuse intensity in the material sliders because to truly tweak a scene into submission requires never exhausting all of your options in any way. In real life there is so much more light around than what we tend come up with in many of our Bryce renders. Rashad, Of course, you are right: the lights, that is the issue. I did not use your rig or anything similar in this new version. Just some more light to ensure that the background is not too dark. I liked the rather strong shadows on the figures, so decided not to change that too much. I did modify the sky colour to get rid of the bluish colour in the Bryce render. I also used a bit more bump on the walls and changed the texture settings on some elements, to bring out the letters and elements on the wall that had disappeared in Bryce. As you say, knowing the tool is key here.